The Huns were divided into two well-marked sections. 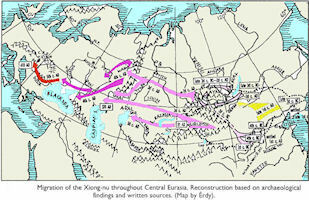 The Huns proper, or Black Huns, in the west; and the White Huns, including the Acatziri Saraguri, etc., in the east. In this the names Black and White are compass points : Black is North and West, White is South and East. They were roughly divided, probably, by the Don. That both sections, although separately governed, treated each other as portions of one nation, is seen in a curious anecdote related by Priscus. The two brothers, Denghizikh and Hernak, were at issue as to the advisability of making war on the Romans. The latter was in favor of peace, because, as Priscus says, the Acatziri Saraguri, and the other Hunnic tribes, who lived by the Caucasus and the Caspian, were then engaged in a war with Persia; and that it would be folly to engage in two wars at once. There were connections between these western Huns, and the provincials; how the Greeks took numbers of them into their service; appointed several of them to places of trust; affected Hunuic customs, and Hunnic dresses. This was the case with the Huns settled on the borders of the empire, under Hernak. Meanwhile, those on the Dniper and the Steppes of the Black Sea became disintegrated by civil strife, and probably coalesced with the various tribes around. It was at this time, probably, the Seklers became the dominant tribe of one set of Slaves, the later Bohemians, while, perhaps, the Antae (Andi ?) may have been another Hunnic tribe who did the same in another area. The earliest information about the Ephthalites comes from the Chinese chronicles, in which it is stated that they were originally a tribe of the great Yue-Chi, living to the north of the Great Wall, and in subjection to the Jwen-Jwen, as were also the Turks at one time. Their original name was Hoa or Hoa-tun; subsequently they styled themselves Ye-tha-i-li-to after the name of their royal family, or more briefly Ye-tha. Before the 5th century AD they began to move westwards, for about 420 they were in Transoxiana, and for the next 130 years they were a menace to Persia, which they continually and successfully invaded, though they never held it as a conquest. The Sassanid king, Bahram V, fought several campaigns with them and succeeded in keeping them at bay, but they defeated and killed Peroz (Firuz), AD 484. His son Kavadh I. (Kobad), being driven out of Persia, took refuge with the Ephthalites, and recovered his throne with the assistance of their khan, whose daughter he had married, but subsequently he engaged in prolonged hostilities with them. The Persians were not quit of the Ephthalites until 557 when Chosroes Anushirwan destroyed their power with the assistance of the Turks, who now make their first appearance in western Asia. While the Western Black Huns were being dissipated, the Eastern Black Huns were consolidating a fresh power. Their main horde was divided into two sections-the Kutrigurs and the Utigurs-respectively named from two brothers, the sons of one of their kings, who divided their allegiance between them. They were divided by the Don, the Kuturgurs lived west of the Marshe of the Maeoter and the Uturgurs to the east of them. Procopius (de Bello Goth IV. 18, Zeuss Die Deutsche under der Nachbarstamme, page 713) has shown from the collocation of several authorities that Uturgur or Utigur and Unnugari are used as common synonyms for the same tribe. Again, the Unnugari are also called Unugunduri and Unungunduri. Now as some authors speak of Utigurs and Kuturgurs so Theophanes and Anastasius speak of the Unnugunduri Bulgari and the Kotragi.Constantine Porphy Togenitus in fact relates that the original name of the Bulgarians was Unungunduri. (See St. Martin's essay on the Bulgarians, who says this name is merely a compound of Hun and Gundur, and compares it with the Burugundi mentioned by Agathias). Again, the great Bulgaria of the old authors is the same land as the country of the Unnugurs. For these reasons somre were disposed to identify Utigur, Unnugur and Bulgar as synonyms of the same tribe. Utigurs and Kuturgurs formed originally one people, the general name of which was probably Ogor. It will be remembered that Priscus, in his narrative of the embassy sent by the Romans to the Turkish Khan Dizabulus, speaks of the great nations of the Ogors as living on the Volga. These Ogors were in fact the wave of population that followed immediately upon the Huns of Attila in their invasion of Europe, were in fact the second tide of Huns. In 498 and 499 the coalition of the tribes of Eastern Huns and Slaves who went by the name of Hunno Vendo Bulgari appeared on the Danube. At this period apparently Bulgari was the generic name for the Eastern Huns. By about 548 these Eastern Huns were divided into the two rival and bitterly striving tribes of the Kutrigurs and Utigurs, the latter of whom more especially seem to have eventually adopted the synonym of Bulgarians. The mutual strife of the two tribes was reported to the Greek Emperor by the Goths of the Krimea, the Gothi Tetraxitae, who wished him to take advantage of it. The Kotrigurs, who were the nearer of the two to the empire, had been for some time in receipt of an annual subsidy from the emperor. The latter now sent an embassy to Sandilkh, the chief of the Utigurs, promising him the subsidy if he would attack the Kutrigurs. At first he objected, saying that although governed by different chiefs, they had the same language, the same dress, the same manners, and the same laws as his own people. (Menander quoted by Thierry op. cit., 341.) But the craftily worded taunts of the envoys at length moved him, and he agreed to attack the rival tribe which was closely allied with the Gepedee. Shortly after the Kutrigurs were savagely attacked by the Utigurs and the Goths and badly beaten, while a large portion of their best cavalry under Kiuialkh were away in Maesia. The latter now made terms with the Romans, who allowed some of them to settle south of the Danube, while others set out to revenge themselves on the Utigurs. The consideration of the Romans for the Kutrigurs, so lately their enemies, drew from Sandilkh, the chief of the Utigurs, a wellworded letter full of signified reproof. 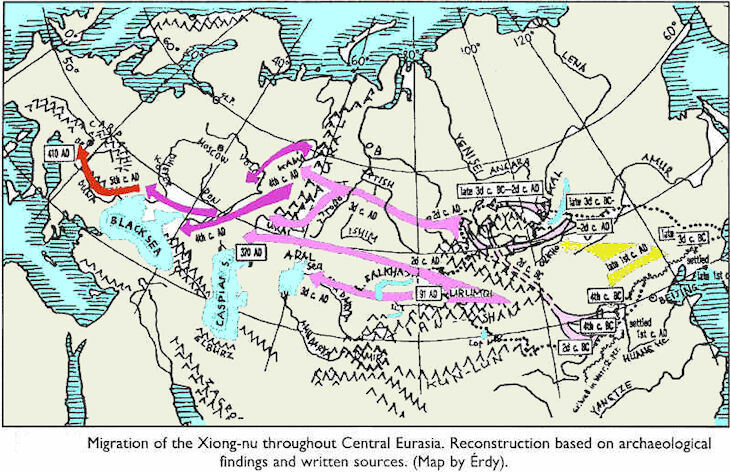 Meanwhile the Utigurs and Kutrigurs continued their suicidal struggle in the steppes of the Euxine. This struggle ended after six years of fighting in the victory of the Kutrigurs, who now turned upon the Romans in revenge for their treacherous correspondence with their rivals, and to regain the annual stipend which had latterly been paid to the latter. The chief of the Kutrigurs was called Zabergan. Gibbon has described in sonorous phrases the victorious march of Zabergan and his followers through Thrace and Macedonia up to the very walls of Byzantium, and how the capital of the Eastern Empire was saved by the skill of the aged Belisarius. After suffering a defeat the Kutrigurs retired towards Thrace, and finding they were not hotly pursued, turned upon its towns, while they extemporised a fleet of very primitive war vessels, described by Agathias, which acted in concert with their army, and they were thus able to ravage the country with impunity, and to return home well laden with booty. When they arrived there they found that the Utigurs had taken advantage of their absence to inflict upon their homes a terrible assault, and thus the strife between the two tribes continued. But it was reaching its end, for both of them fell an easy prey to the Avars, who in 557 invaded Eastern Europe, and in whose empire they became incorporated. The arrival of the Avars put an end to the supremacy of the previous invaders. Sabirs, Sarselt, Hunnugars, Saragors, Akatziri, are all named among their victims, and all assisted in building up their empire. Avares and Huns were very near akin, and have also summarised the history of the latter until they were finally dispersed by Charlemagne. 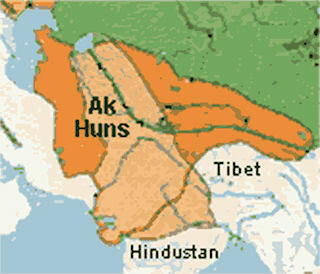 The Ak Huns ruled from 420 AD till 600 AD. Ak in Turkic means white, therefore, Ak Hun means White Huns or Hephthalites. This many-named and enigmatical tribe was of considerable importance in the history of India and Persia in the 5th and 6th centuries, and was known to the Byzantine writers. Their original name was probably something like Aptal or Haptal. They were also called White (that is fair-skinned) Huns. In Arabic and Persian they are known as Haital and in Armenian as Haithal, Idal or Hepthal. The Chinese name Yetha seems an attempt to represent the same sound. In India they were called Hunas. Ephthalite is the usual orthography, but Hephthalite is perhaps more correct. The Huns who invaded India appear to have belonged to the same stock as those who molested Persia. The headquarters of the horde were at Bamian and at Balkh, and from these points they raided south-east and south-west. Skandagupta repelled an invasion in 455, but the defeat of the Persians in 484 probably stimulated their activity, and at the end of the 5th century their chief Toromana penetrated to Malwa in central India and succeeded in holding it for some time. His son Mihiragula (c. 510-540) made Sakala in the Punjab his Indian capital, but the cruelty of his rule provoked the Indian princes to form a confederation and revolt against him about 528. He was not, however, killed, but took refuge in Kashmir, where after a few years he seized the throne and then attacked the neighboring kingdom of Gandhara, perpetrating terrible massacres. About a year after this he died (c. 540), and shortly afterwards the Ephthalites collapsed under the attacks of the Turks. They do not appear to have moved on to another sphere, as these nomadic tribes often did when defeated, and were probably gradually absorbed in the surrounding populations. Their political power perhaps continued in the Gurjara empire, which at one time extended to Bengal in the east and the Nerbudda in the south, and continued in a diminished form until AD 1040. These Gurjaras appear to have entered India in connexion with the Hunnish invasions. Knowledge of the Indian Hunas is chiefly derived from coins, from a few inscriptions distributed from the Punjab to central India, and from the account of the Chinese pilgrim Hsuan Tsang, who visited the country just a century after the death of Mihiragula. The Greek monk Cosmas Indicopleustes, who visited India about 530, describes the ruler of the country, whom he calls Gollas, as a White Hun king, who exacted an oppressive tribute with the help of a large army of cavalry and war elephants. Gollas no doubt represents the last part of the name Mihiragula or Mihirakula. The accounts of the Ephthalites, especially those of the Indian Hunas, dwell on their ferocity and cruelty. They are represented as delighting in massacres and torture, and it is said that popular tradition in India still retains the story that Mihiragula used to amuse himself by rolling elephants down a precipice and watching their agonies. Their invasions shook Indian society and institutions to the foundations, but, unlike the earlier Kushans, they do not seem to have introduced new ideas into India or have acted as other than a destructive force, although they may perhaps have kept up some communication between India and Persia. The first part of Mihiragula seems to be the name of the Persian deity Mithra, but his patron deity was Siva, and he left behind him the reputation of a ferocious persecutor of Buddhism. Many of his coins bear the Nandi bull (Siva's emblem), and the king's name is preceded by the title safti (shah), which had previously been used by the Kushan dynasty. Toramana's coins are found plentifully in Kashmir, which, therefore, probably formed part of the I luna dominions before Mihiragula's time, so that when he fled there after his defeat he was taking refuge, if not with his own subjects, at least with a kindred clan. Greek writers give a more flattering account of the Ephthalites. which may perhaps be due to the fact that they were useful to the East Roman empire as enemies of Persia and also not dangerously near. Procopius says that they were far more civilized than the Huns of Attila, and the Turkish ambassador who was received by Justin is said to have described them as iurnxoL, which may merely mean that they lived in the cities which they conquered. The Chinese writers say that their customs were like those of the Turks; that they had no cities, lived in felt tents, were ignorant of writing and practised polyandry. Nothing whatever is known of their language, but some scholars explain the names Toramana and Jauvla as Turkish. The Chinese statement that the Hoa or Ye-tha were a section of the great Yue-Chi, and that their customs resembled those of the Turks (Tu-Kiue), is probably correct, but does not amount to much, for the relationship did not prevent them from fighting with the Yue-Chi and Turks, and means little more than that they belonged to the warlike and energetic section of central Asian nomads, which is in any case certain. They appear to have been more ferocious and less assimilative than the other conquering tribes. This may, however, be due to the fact that their contact with civilization was so short; the Yue-Chi and Turks had had some commerce with more advanced races before they played any part in political history, but the Ephthalites appear as raw barbarians, and were annihilated as a nation in little more than a hundred years. Like the Yue-Chi they have probably contributed to form some of the physical types of the Indian population, and it is noticeable that polyandry is a recognized institution among many Himalayan tribes, and is also said to be practised secretly by the Jats and other races of the plains.